Deepak Obhrai yelled at everyone at an all-candidates meeting. He says he was just trying to get his point across. Ryan Leef got into a physical altercation with a young woman who tampered with his election sign. And Robert Strickland told a young person to “gain some experience in life” before talking to him about politics. Joe Daniel warned us about the ‘Muslim agenda’. And Larry Miller is worried about, um, Communist revolutions. Jagdish Grewal touts the unconscionable practice of gay conversion therapies. Stephen Harper said an inquiry wasn’t “on his radar.” And he’d hate it if we “committ sociology” on the issue. Bob Zimmer said “lack of a job” is to blame for MMIW. John Cummins blamed the victims. Deepak Obhrai kept yelling that “we all know what happened.” 230 families would beg to differ. And David Wilks thought it’s “people that murder people.” He doesn’t understand why gender is part of the MMIW discussion? Tim Laidler photoshopped his name over another Conservative candidate’s election sign. Bal Gosal’s volunteers were filmed wearing “Team Gosal” jackets tearing down election signs. And what is up with these four candidates? Buddy Ford wanted to run for a party pushing criminal penalties for possessing pot. He was busted in the past for possessing a joint. And Marilyn Gladu said that although marijuana leads to “violence and death,” she also wants to decriminalize it. Ron Liepert doesn’t think civil liberties and freedoms are a part of the country we live in. Blair Dale decided to explain rap lyrics on the internet. And Andy Wang said the solution to youth unemployment is working for free. Jerry Bance peed in a cup. It was not his own cup too. Tim Dutaud filmed prank calls pretending to have a mental illness and having a bad reaction to Viagra. Rick Dykstra was accused of partying with underaged girls at a nightclub, and a member of his team allegedly tried bribing them into silence; Dykstra denied the claim. Augustin Ali Kitoko complimented the NDP. He was promptly dropped as a Conservative candidate. Soheil Eid compared the NDP to the Nazis. Walter Pamic posted dozens of anti-union tirades on Facebook. His company also received $400,000 in government contracts since announcing he’s running for office. And Gilles Guibord doubled down, going sexist and racist at the same time. Gordon Giesbrecht managed to draw a link between abortion and 9/11 plus the holocaust. 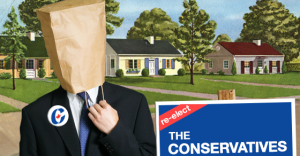 Conservative Party of Canada Jason Kenney Stephen Harper What the fact? Video posted on YouTube Friday shows members of Conservative candidate Bal Gosal's campaign team tearing down election signs in the Toronto-area riding of Brampton Centre. 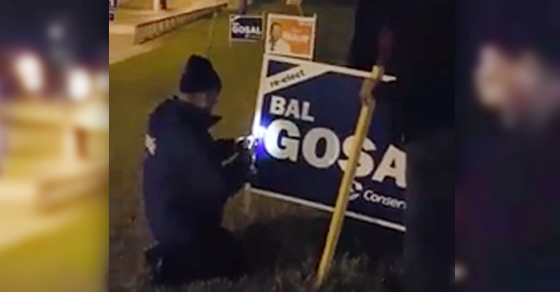 A video posted on YouTube Friday shows members of Conservative candidate Bal Gosal’s campaign team tearing down election signs in the Toronto-area riding of Brampton Centre.